One of the main drivers of recent explosive growth in Frisco is a very strong business community – owners of businesses of all sizes, as well as corporate employees, have many opportunities to meet their peers, share ideas and develop partnerships. For some of the 800 or so new residents arriving in Frisco every month, we created a handy guide to business networking. This is just a starting point, of course. In addition to the events featured below, you can always join a service organization, such as one of two Rotary clubs, Frisco Women’s League, Frisco Garden Club, Frisco Young Professionals, and many more. Four-star accredited Chamber in Frisco is the main hub of the business community in town. It boasts 1300+ members (which they call “Partners”), and the staff works tirelessly on one major event after another. The core of small-business networking is “Get on Track”, a weekly leads meeting hosted by the Chamber Ambassadors since 1999, where business professionals meet for coffee, breakfast, and networking before and after the meeting. Every Thursday morning, starting at 7:45 am, each business in attendance gets 30 seconds for their “commercial”, although extra time can be earned through volunteering in the Ambassador program. Part of what we try to do at the Frisco Chamber of Commerce is help our business community understand the difference in networking versus prospecting and making sales. Prospecting entails generating sales leads, while networking is building and growing professional relationships that someday may lead to sales or new partnerships and collaborations. The Chamber also hosts ribbon cuttings for new businesses, which are open to the public, and there are multiple committees for businesses of a specific type, such as Senior Service Alliance, Healthcare Council, Women Enhancing Business (WEB), International Business Council (IBC), and others. Committees usually meet monthly, and information can be found at friscochamber.com. We offer these events for our partners to help build lasting business relationships. It’s a great opportunity for our staff to make introductions for their clients and bring in new guests to show them what the Legends’ family is all about. The First Thursday Happy Hour (5:00 – 7:00 pm) is a casual opportunity to gather and meet other business owners in the Legends family. The event takes place at a different location each month and typically they provide appetizers and drink specials. The second Wednesday of the month is reserved for the Legendary Lunch – this event is set up to be an educational event on top of the networking. Each month there’s a different speaker who hits on topics relevant to all businesses and industries. The lunch begins with open networking, the guests hear from the featured speaker, and then close with more open networking. This is an RSVP-only event – reach out to info@texlegends.com. Finally, there’s the Third Thursday Breakfast (7:30-9:00 am) – the Legends provide the breakfast tacos and coffee, so all you need to bring is a business card and a smile! This event provides an opportunity to introduce yourself to the group (name and company only because we average over 100 attendees) and there’s a featured speaker. It began six years ago as a North DFW response to the Dallas Architects Happy Hour, but now it’s grown into one of the biggest networking events in Frisco. The goal is to provide area professionals an opportunity to come together to connect and build relationships both professionally and personally. He and his wife Stacy collect everyone’s cards and email them to attendants after the meeting, so you can catch up with someone you didn’t get to meet in person. In the busy months of fall and spring, it’s not unusual to have 150+ people come and go, so be sure to bring plenty of business cards. Note: There will be no event in December, so the January 16, 2019 event should be very well attended. The youngest entry in our networking selection comes courtesy of reigning Frisco Young Professional of the Year, Melanie Nance, a realtor with the Cheney Group. A few months ago, she set up an event targeted toward the newest residents of Frisco, and it exceeded everyone’s expectations, even catching the attention of Dallas Morning News. I started this event to help all of those who are new to the area make friends, find recommendations from the locals, while also having the opportunity to check out a new venue each month. The event is held in a different location every month; December’s event will be at The Reservoir in Frisco on the 13th at 5:30 pm. To keep up with future events, follow @gettoknowfrisco on Instagram or “Get to Know Frisco” on Facebook. 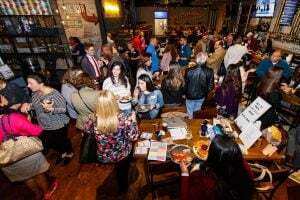 There are numerous networking groups around town; if you have your own favorite, mention it in the comments below the article.